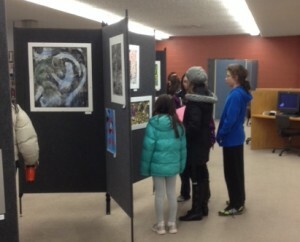 Families and friends are viewing the work of Lincoln High Artists. The whole month of March, Lincoln High art students have their work on display at Bennett Martin Library. Work includes photography, drawing, painting, ceramics, printmaking and digital pieces. The library have been great hosts to help LHS celebrate Youth Art month. The natural public audience they have brings many new eyes to view the students’ pieces.